What Works for Non-standard Workers? Social protection systems are often still designed for the archetypical full-time dependent employee. Work patterns deviating from this model – be it self-employment or online "gig work" – can lead to gaps in social protection coverage. Globalisation and digitalisation are likely to exacerbate this discrepancy as new technologies make it easier and cheaper to offer and find work online, and online work platforms have experienced spectacular growth in recent years. 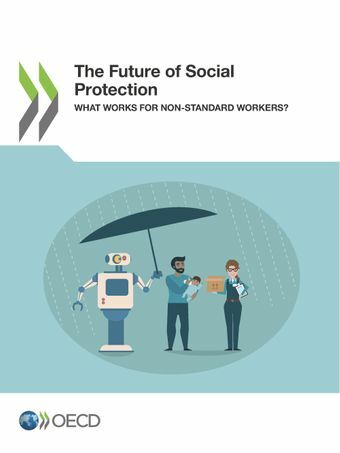 While new technologies and the new forms of work they create bring the incomplete social protection of non-standard workers to the forefront of the international policy debate, non-standard work and policies to address such workers’ situation are not new: across the OECD on average, one in six workers is self-employed, and a further one in eight employees is on a temporary contract. Thus, there are lessons to be learned from country experiences of providing social protection to non-standard workers. This report presents seven policy examples from OECD countries, including the "artists’ insurance system" in Germany or voluntary unemployment insurance for self-employed workers in Sweden. It draws on these studies to suggest policy options for providing social protection for non-standard workers, and for increasing the income security of on-call workers and those on flexible hours contracts. Workers in non-standard #employment, like the self-employed, have limited #SocialProtection. What works for non-standard workers?